I'm getting ready for a girls weekend in a couple of weeks, so have been going through my collection of recipes to see what I should make. It got me thinking of finger food, and then, lunches for work. Work lunch for me is a big thing. I hate going to food courts at lunch time, waiting behind crowds of people to order something that I don't really feel like. The food I actually feel like eating tends to cost a little more, and I just can't justify spending money on mid week lunch (unless it's a Friday lunch with drinks!). If buying, I usually get a salad or Japanese, or a boring sandwich. What's the point of paying $10 for something I can make at home for a couple of dollars? 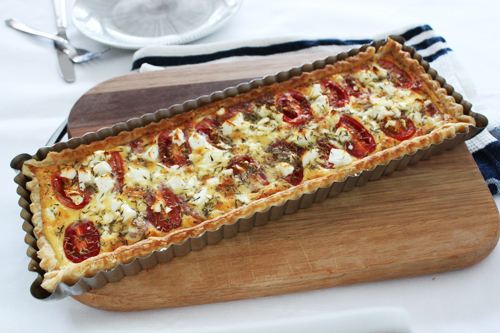 I had this recipes for a Tomato, Feta & Thyme Tart that I pulled out of an old Madison magazine a couple of years ago (found online here). It seemed like a great lunch meal, paired with a salad or soup, so I made one yesterday. It was so simple, and I liked that the ingredients were fridge basics. The original recipe called for a self-made short crush pastry, but after making my French Apple Tart, I had leftover puff pastry that I wanted to use. The original also called for 2 extra egg yolks and 125g of feta, but I found using only 4 eggs I had leftover mixture. I would advise that if you're using a 23 cm round tin (as used in the original recipe) to add those extra eggs and feta. Couple of other notes - after 30 minutes my tart was done, but I had to stick it under the grill for a minute or so to get that lovely golden colour. This is mainly because I have a very old electric oven, so I usually have issues like this. Also, a drizzle of olive oil and or parmesan (especially if sticking under the grill) finishes the tart off beautifully. Place a sheet of baking paper over the pastry and top with baking weights (or something like rice) and blind bake in the oven for 15 minutes. After 15 minutes, remove the tin from the oven and discard the paper and weights. Place the tin back in the oven and cook for a further 5 minutes or until pastry is lightly golden. In a bowl, add the eggs, cream, parmesan and salt and pepper and mix well. 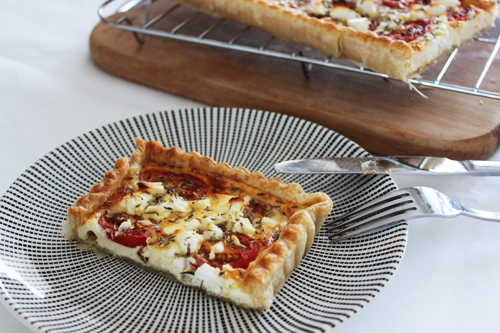 Place the tomatoes evenly on the tart, and then carefully fill the tart with the egg mixture. Crumble the feta over the top and sprinkle over the thyme. Bake in the oven for 30 minutes or until set and golden.